New Delhi – Donald Trump's presidency has cost the family firm "millions of dollars" in lost business, his son told an Indian newspaper during a visit aimed at drumming up sales of new luxury apartment complexes. Donald Trump Jr told the Times of India that the Trump Organisation was turning down new business opportunities around the world because of his father's position. Trump Jr is in India to promote a series of luxury apartment developments being marketed under his father's name. The 47-storey towers will comprise 250 homes and are expected to be completed by 2023, with price ranging from $850 000-$1.7m. The Indian developers say the high-rise apartment complex boasting floor-to-ceiling windows, state of the art amenities and a "lifestyle concierge" has already clocked up sales worth nearly $80m. Trump Jr is on an unofficial visit to India, but will address a business conference on Friday on the subject of Indo-Pacific ties. Indian Prime Minister Narendra Modi is the keynote speaker at the event. Critics say the Trump family's continued involvement could allow the firm to profit from foreign governments eager to curry favour in Washington. 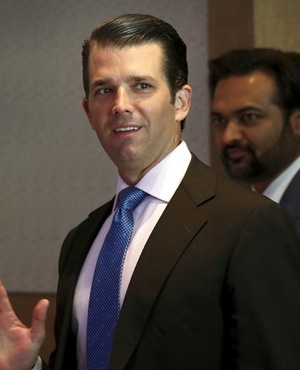 But Trump Jr said the firm was focusing on existing developments rather than seeking new business opportunities in India, its biggest market outside the United States. He praised Modi's economic reforms and said India was a better place to do business than regional rival China. The Trump family earned $3m in royalties in 2016 from ventures in India, according to a New York Times report.